Day of the Dead: Bloodline (2018) - Sci-fi-central.com. Bulgaria / USA  2018  90m   Directed by: Hèctor Hernández Vicens.  Starring: Sophie Skelton, Johnathon Schaech, Jeff Gum, Marcus Vanco, Mark Rhino Smith, Lillian Blankenship, Shari Watson, Rachel O'Meara, Luke Cousins, Lorina Kamburova, Cristina Serafini, Debbie Sherman, Nathan Cooper.  Music by: Frederik Wiedmann. George Romero pretty much screwed up the 'Living Dead' franchise with everything from Land of the Dead (2005) onwards, but it was his to ruin. Director Hèctor Hernández Vicens, on the other hand, has no place in making such a travesty as this 'Bold New Vision' of Romero's classic Day of the Dead (1985). An insult to the original in almost every way imaginable, Bloodline will give zombie fans nightmares, but for all the wrong reasons. First off, the undead in this film are referred to as 'rotters', which makes them sound like something out of a Billy Bunter comic strip. 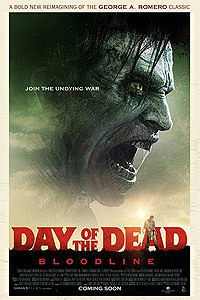 And if you thought that the vegetarian zombie in Steve Miner's Day of the Dead (2008) was a dumb idea, wait until you get a load of Max (Johnathon Schaech), who is clearly intended to be the equivalent of Bub from Romero's movie, a zombie with the ability to reason. Max is a stealth zombie, able to sneak into the military base by hanging onto the underside of a vehicle, and then slope off into the main building where he crawls through the air ducts. He's a stalker too, following pretty doctor Zoe Parker (Sophie Skelton), the subject of his obsession before he was 'turned', using his amazing tracking skills. On top of all that, he can talk too. I bet if someone passed him a few oranges, he could juggle as well. The other zombies are of the running kind that roar like a T-Rex. The humans are equally as irritating. Zoe might have good intentions, trying to create a vaccine to the zombie virus, but her reckless behaviour endangers all those around her, and ultimately costs the lives of almost all of those in the camp. The bad guy, Miguel (Jeff Gum), is a pale imitation of Captain Rhodes from Romero's film, and Zoe's love interest Baca (Marcus Vanco) is merely pretty-boy eye candy for the ladies. There's even a cute kid in the form of Lily (Lillian Blankenship), who Zoe risks all to save (certainly, many die so that she can live). I guess what this film clearly illustrates is just how great Romero was in his prime: his first three zombie films still stand as three of the best the genre has to offer, even after all of these years. Review by BA_Harrison from the Internet Movie Database.